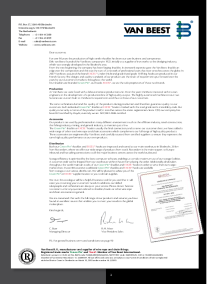 Van Beest is manufacturer of Green Pin® shackles, Excel® hooks and steel wire rope and chain accessories. Both ranges offer high quality products against competitive prices. We sell our products to stockholding distributors in over 80 countries worldwide. In Holland we manufacture Green Pin® shackles in various shapes and sizes, suitable for many different applications: shipping, general industry, building, oil and gas etc. Green Pin® shackles comply with many internationally recognized standards and can be supplied with various certificates. We also offer a wide range of additional accessories like sockets, turnbuckles etc. to complete your lifting assembly. The latest addition to our range is the Green Pin® ROV Release Polar shackle, designed for under water use in harsh conditions. This design, developed in close cooperation with the users of this type of products, makes it easy to manipulate by a robot. The three different types, available in various sizes, will solve nearly every ROV lifting application you can imagine.